The campaign of the Russian helicopter pilot Ka-50 Black Shark for the simulator DCS; Ka-50 Black Shark, ver.1.0.2. The young pilot after graduating from the military flying school voluntarily agrees to "100" days. This 100-day trip to the zone of hostilities in the Caucasus. All events and names in the campaign fictitious. The realities and challenges to be faced in the campaign pilot military aviation in Russia. Bring the service with honor. Russian version of the campaign. At the moment it is one tenth of the campaign (20 missions) from the planned 10 (200 missions). (C) Campaign VERGEEV Group, R. Leveshko, 2010. Archive campaign unpack into a directory campaigns simulator DCS: Ka-50 Black Shark version 1.0.2. In other versions of the simulator correct operation of the campaign VERGEEV Group not guaranteed. Campaign missions are protected from editing. Do not use the built-in editor to modify the conditions of the simulator missions campaign and do not click "Scheduler missions" in the briefing missions. Make a backup copy of the campaign! To support its copy of the simulator use the resources of the company DCS. 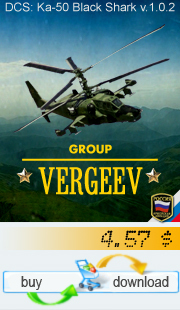 The campaign has all the necessary teaching materials: maps, radio communications and instructions for entering the VERGEEV Group to go through all the campaign missions. (C) Campaign VERGEEV Group, R. Leveshko, 2010.